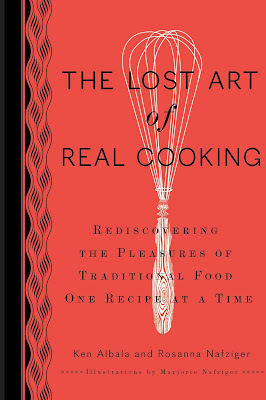 What Julia Ate: The Lost Art of Real Cooking - Give Away! A while back, I received this special little book in the mail, The Lost Art of Real Cooking by Ken Albala and Rosanna Nafziger. I was immediately taken with it, and since then, it's been moving around the house with me, sitting on my night stand and taking up residence in the kitchen. I intended to read it thoroughly before writing this, but due to the nature of the book, I wandered a little. I got carried away. I picked it up and put it down. I don't think the authors would mind this a bit. I think this book wants you to open it up and just delve into it. It doesn't necessarily need a read through. And it can be revisited over and over. Eclectic, esoteric, irreverent were some of the words used to describe this book of sometimes "laborious and inconvenient" things to make. It's not so much a book of recipes, as it is a book of cooking ideas. Take the pretension out of many of the delicacies that you find being peddled at fancy food establishments, and a good deal of the time you'll find food that folks like you and me have been making for hundreds of years. There are many sections to get lost in, from fermented vegetables to fermented beverages, bread making, meat curing, fresh pasta, grains and desserts. And don't forget jams! There is a good sense of humor, from both writers, who take turns explaining their respective topics. Albala is a professor of history (and author of many books), so you'll get some interesting information on say, a medieval pig recipe. Nafziger is a chef and editor who hails from West Virginia, and likes to reference her homespun West Virginian upbringing. 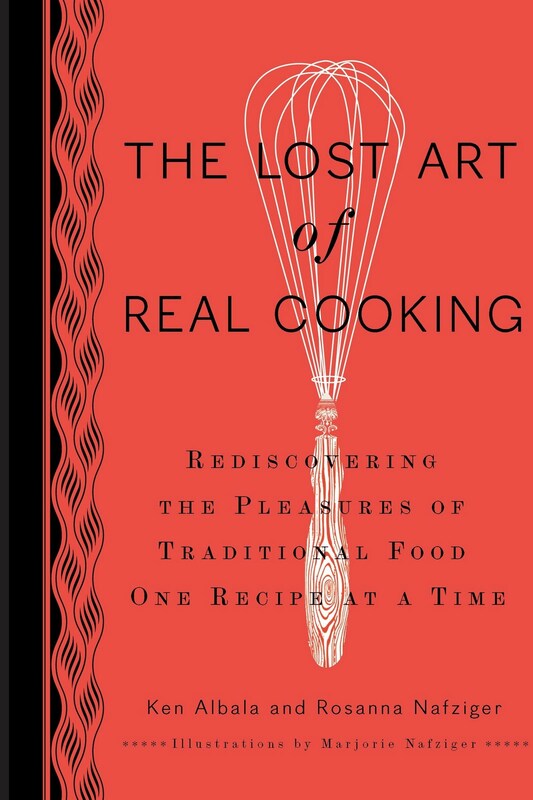 The book itself is formatted like an old-timey cookbook, which if you're like me, and have piles of cookbooks spilling out of your bookshelves, you know all about. Vaguely cryptic and sometimes insufficient in detail, these kinds of books have recipes like little pieces of flash fiction, all of a paragraph long. In The Lost Art of Real Cooking, the narrative is the route taken on most of these, and I'll be honest, it flusters me sometimes. Although I like to wing it, and make things my own, I do like bullet points and clarity. But it teaches a great lesson: get in there and just do it, all ready! Stop shilly-shallying and make the goshdarn fermented pickles already! So, I'll admit it. I've made a great deal of cucumber pickles in my life, but never fermented them! Gadzooks! Please don't think less of me. I've jumped this hurdle, and made it safely on the other side. Why, you ask? Oh, I don't know. I've fermented other things, but cucumbers just didn't make the list. This book nudged me. It said: come on, just put some cucumbers in some water, salt, spices and vinegar and just do it already. It's one of the nicest parts of this book. It's encouragement makes you feel like you made the decision yourself, when in fact they were nudging you all along. I packed my garden's cucumbers into a sterilized half-gallon mason jar. I put in two garlic cloves, and some pickling spices, a bay leaf, and a dried hot pepper. I covered it in a brine made of 1/2 cup of kosher salt mixed with 8 cups of water. I stuck a glass in the jar (which I saw being done on a blog, but I can't remember which one! What a great idea!) to weigh the cucumbers down, keeping them submerged under the liquid. I put the jar in the basement, and almost three weeks later, I had the most incredible, crunchy, salty, sour pickles I have ever had. And I've had some good pickles. To win a free copy of this liberating book, leave me a comment below and tell me what inconvenient and laborious foods you've been making this summer! You have until midnight, Wednesday, August 25 when the winner will be picked by the random-number generator. Please make sure to leave an e-mail address if you don't have a blog linked to your comment, so I can find you if you win! Canning peaches! I hope peeling all those skins and wrestling out the pits was worth it. The book looks fabulous. I really need to stop shilly-shallying and ferment some pickles. Some days I want quick quick food and other days I indulge in making homemade pizza crust, slow roasting tomatoes, caramelizing onions, homemade buttermilk dressing. Orangettes might be the most inconvenient and laborious, but those were not made this summer. The making did not feel inconvenient or laborious on that day. It was quite fun. Enjoy your pickles! I have been chopping my own salsa, which to me is quite laborious. I've made an oven roasted ratatouille, which after much slicing and dicing roasts for up to an hour and a half in the oven. I have also been baking my own bread. Some people will laugh at this, but not everyone has time for these delicious things! I have also been baking pretty much everything in Good to the Grain by Kim Boyce, and many of those recipes are time consuming, though the results are totally worth it. I think the other comments posted here are going to have a lot of great ideas. Salsa Verde, loads of it. We just can't get enough right now. Hope we feel the same way this winter when we are still eating it!!! I made pickles, but even simpler. 4% brine plus dill and garlic. I use a ziploc bag filled with more brine to weigh down the food. And kraut and kimchi and shredded carrot-beet pickles. I've also been making feta cheese, with others on the way. Next up, pastrami. But no jam yet this summer. I have been making (as I do every year) Pear Butter. I have a tree (that is actually in my mother in law's yard next door) that I pick from, peel & then cook down for hours. It takes lots of Pears to make even just 1 jar of Pear Butter. I also did lots of fig preserves from a Fig Tree in my yard. They are not peeled but takes hours to cook. But I do enjoy all of this. I also collect cookbooks & love reading them like a novel. I have a 12yo son who is handicap & in a wheelchair (unable to do anything for himself) & he loves for us to read recipes & cookbooks to him. He also enjoys being in the kitchen. i've been making my own mayonnaise. by hand. it's a labor of love, for sure! i make pickles, too, but need to get better at it! What a great looking book! Summer is my least laborious time in the kitchen, if you don't count watering our windowsill herb garden 10 times a day or battling the heat spewed out by the oven (a whirlwind of baking ensues-- I really can only stand this thing to be on once a week). So my labors have been battling the heat and one recipe for a raw kale salad where I have to massage the leaves with a lemon dressing for about 10 minutes leaves my wrists on the verge of carpal tunnel but at least gives my forearms a nice workout. And it's delicious! Well, the only thing I have done yet this summer is green beans. I have some peaches setting in the 3 seasons room ready to can though! This is a summer of experiments for me, too! I've yet to try those sour pickles (which I needed a nudge to do, too! ), but have been making a number of "small ferment" drinks found in Wild Fermentation. Sweet Potato Fly was just bottled yesterday, and my second batch of Ginger Beer is ready to bottle today. Ginger beer is by far my favorite, and needs a full 2 weeks on the counter before venturing into the fridge for drinking... A long wait. This book does look entertaining, and I'll add it to my list of readables! I find watermelon rind pickles to be the most time consuming (though the spicy ones are well worth it), followed by some Indian fruit/oil pickles with a hundred million ingredients. So far this summer I've canned salsa, blueberry butter, tart cherry butter, and a wonderful tomato sauce last weekend for the CanJam. Freestone season starts in a week or so, and I'll soon be up to my elbows in peach jams, butter, salsa, and chutney. homemade salsa with cherry tomatoes. oooh those little ones take time to chop but the sungolds and black cherries are so beautiful together. fruit butters! Definitely fruit butters, there's all that peeling, pitting, coring, dicing! My next big fear (and therefore, project)is baking, because even though people have been doing it for hundreds of years it seems so much more like science. Ermm.... I would say the jams are probably the most laborious... only because I have to can them and it sometimes it *seems* like it takes forever for the jam to set. But the payoff is SO worth it. I just happened upon your blog while looking for canning receipts. It's great! I've never canned or gardened before. This year I decided to do both! I grew tomatillos, tomatoes, zucchinis & peppers! I've made roasted green & red salsa, canned tomatoes, & relish & pickles. Pickling jalapenos was the easiest. I'm still canning tomatoes! I didn't know you could freeze them & can them later. What's the best way to do this? That cookbook sounds great...it covers (seemingly) such a range of things. I just slow-roasted tomatoes. Three hours of having the oven on. I have made bread from hand. the kneading it and then letting it rise takes some time. I have also made zucchini bread with more zucchini than called for because I make it for a 4 yr old nephew who doesn't care for veggies but loves this bread. I've been attempting to make my own alcohol... woowee. We'll see how it works out! Oh man, I've been making lots of fruit butter (peach, rhubarb, blueberry, etc.) this summer and even though I've tried every time-saving technique under the sun, nothing makes that stuff cook down in less than 2 or 3 hours. My patience is wearing down as thin as my legs! Cumquat and Lime Marmalade- worth every second of doing all the de-pipping, slicing and cooking. I think its been my favourite one this year. Julia, those pickles look lovely- I hope they taste fantastic for you. Julia - you know me, I make EVERYTHING the slow way, beginning with the garden. This summer I've been fermenting more things than canning since that is my goal. This book would be a lovely addition to my collection. Apple butter, and fermenting rice to achieve better mineral absorption. Homemade pasta. Yes, the stuff you buy at the grocery store is soooo much easier and cheaper, too, but the real deal is way better. I've got corn drying for another project. When the fresh olives come in I will be doing them. It's been too hot here to make bread. I will be soon. Canning of course, lots of it. Saurkraut it's going as I speak/write. Rumtopf is going. I think that is it for now. Canning peaches and making salsas. Peeling those suckers never seems to come easy to me, even with the boiling water and ice water dips. Creamy Gazpacho was one of my labor intensive feats this summer. Lots of chopping, salting, waiting, straining, draining, pureeing, etc.! Apart from the canjam, I haven't been cooking that much, just enjoying fresh produce- mangos, watermelon, grilled corn and squash are the best! Definitely peaches. We picked a bushel and by the next day they were already going soft. They didn't come out looking as pretty as I would have liked, but they are in a honey sugar syrup so I am sure they will be delicious. I just started canning for the first time. So fun, but a bit laborious at first what with getting the timing right and learning how to do it all. Sour Cherry Jam was my 3rd project and pitting 3 lbs. of cherries was quite a bit of work! I have been having my most productive month so far on my food journey. Pickled watermelon rinds were pretty labor intensive! I also made pickles, but not fermented...those will come with my next batch of cucumbers. Kimchi, Kombucha, herbed salts and other yummy things are also sitting in the kitchen. WOuld love to read this book, thanks for the opportunity! This book looks super interesting! I would have to say that some of my pickling this year was super labor intensive. Also, apple processing into all the component items was pretty labor intensive, but I know I will appreciate all the hard work and 40 pounds of apples later in the year! Oh, lordy, you know all about my laborious loves. But peeling that damned watermelon? Nothin' like it. I'm a grad student preparing to collect my dissertation data in the fall, so all of my canning this year has seemed not only indulgent (how dare I run tomato paste through the food mill when there are articles to be read and literature reviews to be drafted?) but inconvenient and laborious. Luckily, I have a good friend to remind me that we need these moments to remind us that life is not all just graduate school. Keeps me in the moment.